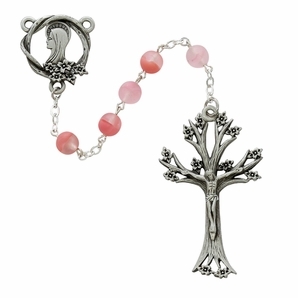 This is a unique rosary symbolic of the Legend of the Dogwood Tree, having a Dogwood Tree Crucifix, a centerpiece of Our Lady encircled in Dogwood branches and blossoms, and variegated rose pink and crystal subtly frosted beads reminiscent of the Dogwood Tree. 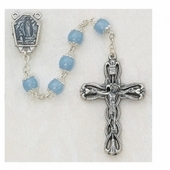 Both the crucifix and centerpiece are pewter. Chain is silver plated. 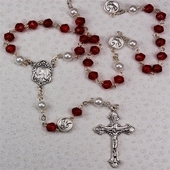 Rosary measures about 21 1/2" doubled with 7mm beads. 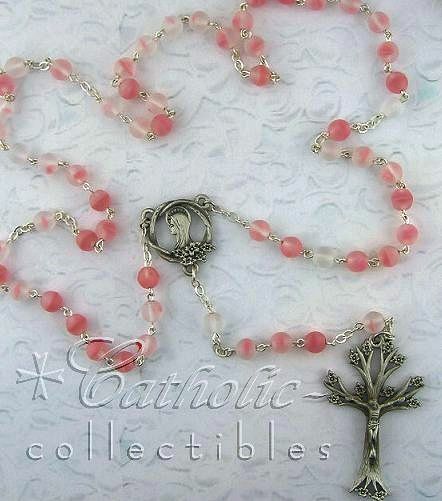 The unusual Dogwood Crucifix is beautiful and quite large at 2" x 1 1/4" wide, and the centerpiece measures 7/8" across. This is one of my personal favorites that I reach for often and I have given several of these as gifts that have been very well received. VERY beautiful in person! 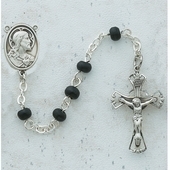 Your rosary will arrive in a rich wine tone velvet presentation box. 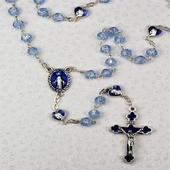 This rosary is brand new and strikingly beautiful. It would make an excellent gift for someone special or for yourself!